I put Psycho aside…there’s nothing wrong with the book, but it kind of reads like a less, um…lovely(?) version of the film. The plot is essentially the same, but the character of Norman is not nearly so interesting as the movie’s version. For me, this is one of those rare cases where I think the movie is definitely better than the book! But, with that said, I’ll pick it up again sometime, see if it suits me better then. To replace Psycho, I picked up Miss Peregrine’s Home for Peculiar Children again. I started this a long time ago, but wasn’t enthralled with it like a lot of people are. I’m continuing on, however, and it’s getting more interesting now, so I’m hoping that I’ll enjoy it more as the story progresses! Also still listening to It, but I’m taking my time with that one, so I’ll probably be listening to it for quite a while. I got one short story submission ready last week, which was good. Now I can focus more attention on the other one, which is still in first edits stage. And for longer works…my novella, which I then lengthened into a short novel, I’m now adding more to again! I didn’t want to add any more because I think the story has enough of a main plot/sub plot structure that I didn’t want to create an entirely new storyline just to add words. But then I realized that I was looking at things the wrong way. I only need to add about 10k to make the novel a more proper length, and I can do that by adding some great scenes to the already existing plot lines. Yay for epiphanies! I’m over halfway to my addition goal, and then I’ll work on editing the additions on their own a couple of times before I fit them into the story and go over the entire work again to make sure everything flows. See above for my most recent epiphany! Sometimes realizations come slowly, over time and with a considerable amount of mental effort. But occasionally, things just happen all at once. You snap into an idea, and suddenly you can’t figure out why it took so long for you to see things that way. Our little guy will be six months old tomorrow! We have a doctor’s appointment today for his latest shots, so we’ll probably be taking it easy for the afternoon/evening. Then on Saturday we’re meeting with a potential daycare provider for when I return to work in September. It’s still six months away, but with how quickly the last months have gone, I’m sure this spring and summer are going to fly by. Hooray for epiphanies! Glad to hear your writing's going well. 🙂 I've had Miss Peregrine's Home for Peculiar Children on my TBR for a while now – I really should get around to reading it! Aw, Happy Half-Birthday to your little boy for tomorrow! 😉 Have a great week! Awesome work on turning your short into a novella and then into a novel. It's great when inspiration hits and you can expand upon a story. Congrats on the epiphany! 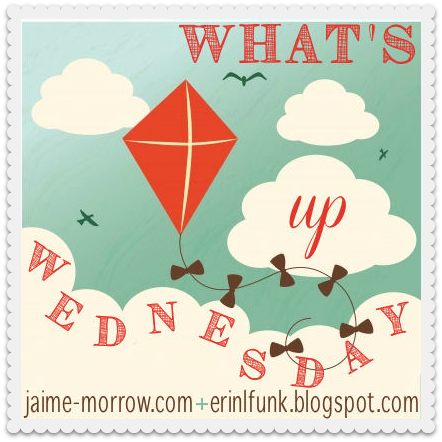 My What's Up Wednesday post.